The 2018 East Tennessee History Fair will celebrate the region’s history with reenactments, activities, and tours. Presented by the East Tennessee Historical Society, along with dozens of businesses, historical organizations, museums, musicians, and individuals from across the region, the East Tennessee History Fair features fun and educational activities highlighting the people, places, stories, and events that comprise the shared history of our 35-county region. The event is free and everyone is invited. The event will be held at Market Square & Krutch Park and at Clinch & Gay Streets in Downtown Knoxville on Saturday August 18 from 10:00 a.m. to 5:00 p.m.
• Free admission to the Museum of East Tennessee History including Voices of the Land: The People of East Tennessee and In the Footsteps of Sergeant York exhibitions, plus the Streetscape with Streetcar 409 and Corner Drug Store, c. 1920-1930. This year marks the celebration of 25 years of the Museum of East Tennessee History and the 10 year anniversary of the Voices of the Land exhibit. Artifact donors, living historians, and collections experts will offer special tours and discussions throughout the museum. • Antiques Fair—downtown Knoxville’s only antiques fair with vendors offering a wide variety of primitives, antiques, and tabletop items, sponsored by Case Antiques and Building Systems Technology, Inc.
• Home style food, food trucks, burgers, kettle corn, and barbeque! 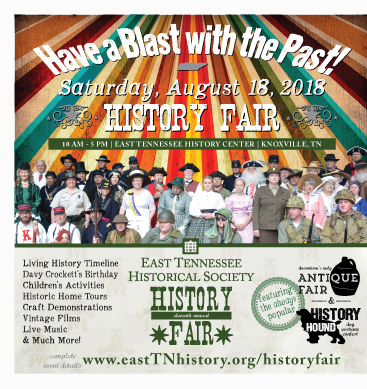 The 2018 East Tennessee History Fair is sponsored by Knoxville CBID, The Tennessee Arts Commission, Seven Islands Foundation, Mast General Store, City of Knoxville, WDVX, WBIR, WUOT, Comcast, Lamar Advertising, KANA Group, Hyatt Place Knoxville/Downtown, Regions Bank, Case Antiques, Building Systems Technology, Inc., PetSafe, and Food City. For more information on the History Fair, please visit www.easttnhistory.org/eastTNhistoryfair. Established in 1834, the East Tennessee Historical Society is one of the most active history organizations in the state and enjoys a national reputation for excellence in programming, teacher and student education, and exhibitions. For 184 years the East Tennessee Historical Society has been helping East Tennesseans hold on to our unique heritage - recording the events, collecting the artifacts, and saving the stories that comprise the history we all share. The historical society pursues its educational mission through publications, lectures, conferences, school programs, museum exhibits, and heritage programs such as the popular “First Families of Tennessee” and “Civil War Families of Tennessee.” The East Tennessee Historical Society and Museum are housed in the East Tennessee History Center, 601 S. Gay Street, Knoxville, across from the Tennessee Theatre. Also located in the center are the Calvin M. McClung Historical Collection and the Knox County Archives.